Mandibular first molars show most of the anatomical variations not only in the number of canals but also in the presence of number of roots and their morphology. The presence of additional root either lingually or buccally in addition to two roots is one of the complex morphological variations. Diagnosis, identification, and treatment of these variations need adequate knowledge of root and root canal anatomy and configurations which can contribute to the better outcome. This case report discusses the endodontic treatment of two mandibular first molars with a radix entomolaris (RE), which are rare macrostructures. The prevalence, the external morphological variations, and internal anatomy of the RE are described. This case report discusses the diagnosis and successful endodontic management of two cases showing unusual root canal configuration in a mandibular first molar (36 and 46) showing three roots and four canals. A 36-year-old male patient reported to the Department of Conservative Dentistry and Endodontics with a chief complaint of pain in lower-left back tooth region for 1 month. The patient revealed a history of mild intermittent pain for the past 1 month, which had increased in intensity during the past 1 week. The patient reported prolonged sensitivity to hot and cold substances. The pain was spontaneous and aggravated particularly at night. Clinical examination revealed deep occlusal carious lesions on mandibular first molar. The tooth 36 was tender to vertical percussion. The preoperative radiograph revealed radiolucency of carious lesion involving the pulp with respect to 36 [Figure 1]a. Based on the clinical and radiographic findings, a diagnosis of symptomatic irreversible pulpitis with symptomatic apical periodontitis with respect to 36 was made, informed consent was obtained, and endodontic treatment was initiated. A 27-year-old female patient reported to the Department of Conservative Dentistry and Endodontics with a chief complaint of pain in lower-right back tooth region for 2 months. The patient revealed a history of mild intermittent pain for the past 2 months, which had increased in intensity during the past 2 weeks. The patient reported prolonged sensitivity to hot and cold substances. The pain was spontaneous and aggravated particularly at night. Clinical examination revealed deep occlusal carious lesions on mandibular first molar. The tooth 46 was tender to vertical percussion. The preoperative radiograph revealed radiolucency of carious lesion involving the pulp with respect to 46 with periapical radioopacity [Figure 2]a. Based on the clinical and radiographic findings, a diagnosis of symptomatic irreversible pulpitis with symptomatic apical periodontitis and condensing osteitis with respect to 46 was made, informed consent was obtained, and endodontic treatment was initiated. Radiographic evaluation of the involved teeth revealed two completely formed roots with no indication of any variation in the root canal anatomy in 36 and 46. The teeth were anesthetized using lignocaine. After caries excavation, rubber dam isolation was done and access cavity was prepared on tooth 36 and tooth 46. On inspection with a DG-16 endodontic explorer initially, the pulp chamber floor revealed three canals – mesiobuccal, mesiolingual, and the distal. A search for the second distal canal was made by further exploration of the pulpal floor with a DG-16 endodontic explorer. A catch disto lingually unveiled the second distal orifice, and the access cavity was modified from a triangular form to a trapezoidal shape to include the distolingual canal. Negotiation of the canals was carried out with ISO size 6, 8, and 10 K files. Working length was determined using the Raypex 6 (VDW) apex locator with 15 No. K files and was verified using periapical radiograph. The working length radiograph taken with different horizontal angulations revealed the presence of a third root located distolingually [Figure 1]b and [Figure 2]b. Cleaning and shaping was done using Protaper (Dentsple Maillifer) rotary files with respect to 36 and 46. All the canals were irrigated using 3% sodium hypochlorite solution and 17% Ethylene Diamine Tetra Acetate solution. The canals were finally flushed with sterile saline. Master cones were inserted to the working length and were confirmed radiographically [Figure 1]c and [Figure 2]c. The canals were dried with paper points and obturation was performed followed by postobturation restoration. 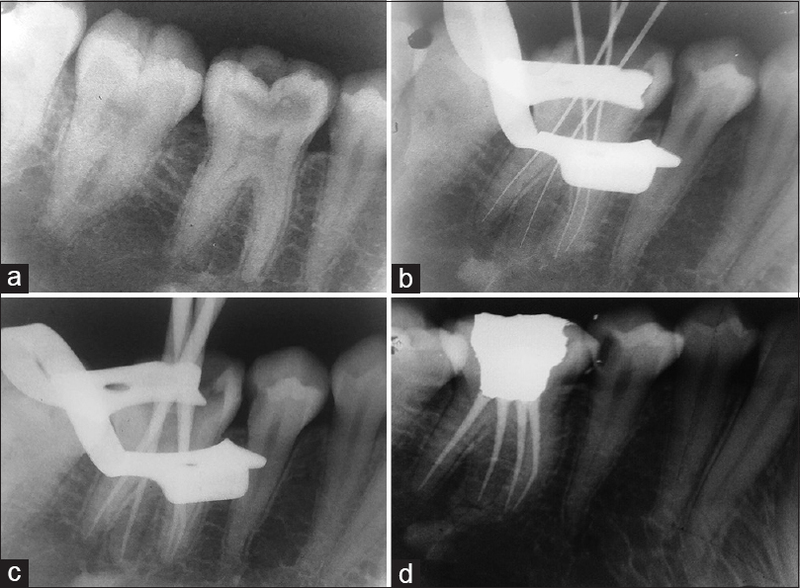 Final radiographs were taken to establish the quality of the obturation [Figure 1]d and [Figure 2]d.
In the present case report, the location and identification of the canal orifices were done by conventional methods using the DG-16 endodontic explorer, knowledge of the roots, and root canal anatomy along with that of the conventional periapical radiographs to determine the canal configuration. The RE in both the cases was found to be with straight root and root canal classified to be De Moors Classification Type I which was managed successfully. Thorough knowledge and careful examination of the floor of the pulp chamber with conventional radiographs with different angulations to determine the root canal anatomy, in clinical conditions, are essential parts of successful management of anatomical variations in endodontic treatment. Souza-Flamini LE, Leoni GB, Chaves JF, Versiani MA, Cruz-Filho AM, Pécora JD, et al. The radix entomolaris and paramolaris: A micro-computed tomographic study of 3-rooted mandibular first molars. J Endod 2014;40:1616-21. Calberson FL, De Moor RJ, Deroose CA. 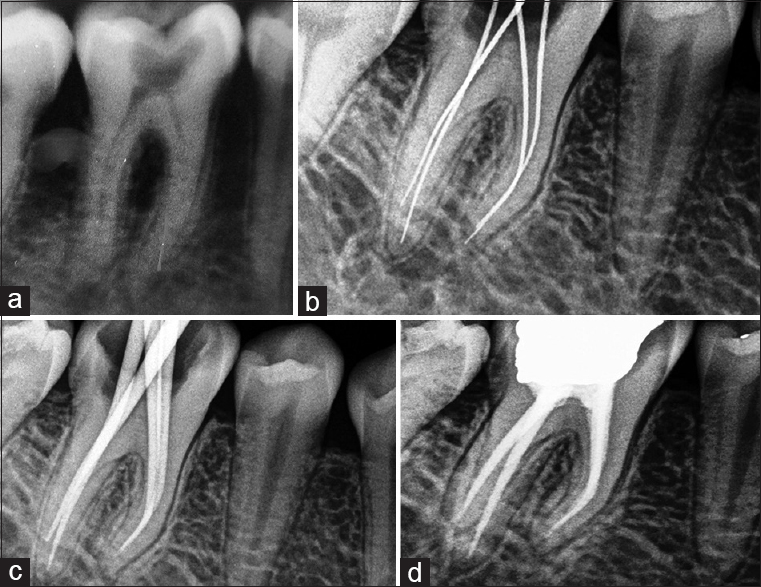 The radix entomolaris and paramolaris: Clinical approach in endodontics. J Endod 2007;33:58-63. Attam K, Nawal RR, Utneja S, Talwar S. Radix entomolaris in mandibular first molars in Indian population: A review and case report. Case Rep Dent 2012;2012:595494. Hasjem AA, Ahmed HM. Endodontic management of a mandibular first molar with unusual canal morphology. Eur Endod J 2017;2:5. Fava LR, Weinfeld I, Fabri FP, Pais CR. Four second molars with single roots and single canals in the same patient. Int Endod J 2000;33:138-42. Sarangi P, Uppin VM. Mandibular first molar with a radix entomolaris: An endodontic dilemma. J Dent (Tehran) 2014;11:118-22. Parashar A, Gupta S, Zingade A, Parashar S. The radix entomolaris and paramolaris: A review and case reports with clinical implications. J Interdiscip Med Dent Sci 2015;3:1-5. Mukhaimer R, Azizi Z. Incidence of radix entomolaris in mandibular first molars in Palestinian population: A Clinical investigation. Int Sch Res Notices 2014;2014:405601.